Fill out the ARES Registration form and submit it to your local Emergency Coordinator. Need a License or upgrade? A test session is scheduled every 3rd Thursday monthly at the EOC. Walk-ins welcome. The fee is $14.00, Please bring a photo ID as well as a 2nd form of ID. If your upgrading bring a signed copy of your existing license. For more info how to prepare for your test contact John Blaisdell – W4CJB at w4cjb@arrl.net. Walton County ARES is now using Outpost PMM as a backup to DSTAR and DRATS. The digipeater is operating negative split. RX is 144.990mHz and TX is 144.390mHz no tone access is required. The BBS mailbox is N4EMA-1. There are still Hams who don’t have DSTAR radios and Outpost is another way to connect by packet, bbs or keyboard to keyboard. Here’s the link. Check it out. http://www.outpostpm.org/index.php Their is also a great youtube series on Outpost PMM setup and install. WCARC Tailgate April 20, 2019 US 331 DeFuniak Springs The WCARC annual tailgate will be held at the Farmers market next to Burger King on 331 South in DeFuniak Springs. Club Breakfast May 4, 2019 at 8:00 am – 9:00 am 328 Highway 90 DeFuniak Springs, FL. Breakfast at Corner Cafe' on the Saturday before the monthly meeting. Everyone is welcome to join us Ham or not. Club Meeting May 7, 2019 at 7:30 pm – 8:30 pm 312 College Ave. Defuniak Springs, FL. 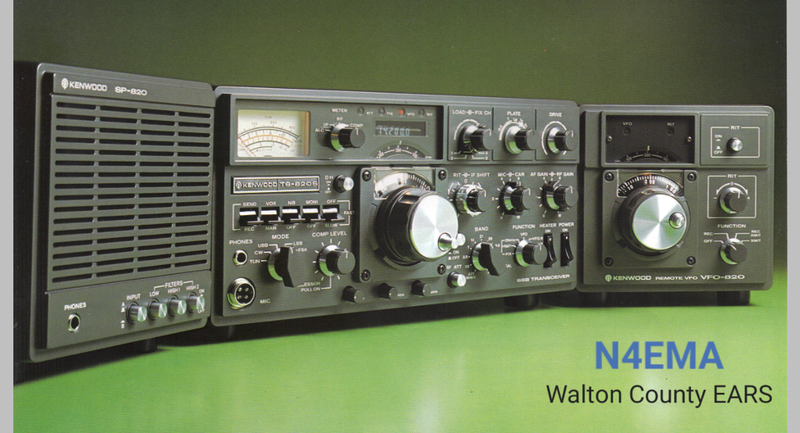 The Walton County Amateur Radio Club's Monthly meeting is held on the first Tuesday of every month at 7:30pm. The location is - The Life Enrichment Senior Center 312 College Ave. DeFuniak Springs, Fl 32435.